Railway Station– The railway station for Raipur is ” Raipur Junction Station”. 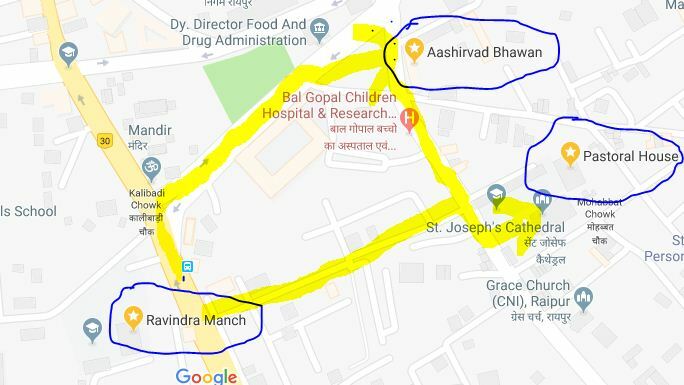 On getting down at the Raipur railway station you all have to come to Sarvadharma Hanuman Mandir which is on left side of exit of Platform no.1. NHA voulunteers holding flexi/placard/printout of JSA/NHA will be waiting there to guide you to pre-paid auto/taxi/cab/ola cab that can be taken to reach the place of accommodation. In case of any querry, the contact persons for contacting are Amulya Nidhi- 9425311547/9826774739 , Gargeya- 9948971353. The main venue of NHA for participants to arrive is Ravindra Manch, Kalibadi Chowk, Raipur. Some of the parallel sessions ( after 11:30 AM everyday) would be happening at Ashirvaad Bhawan and Pastoral house as well. Distance from Raipur airport- 15 km aprx. 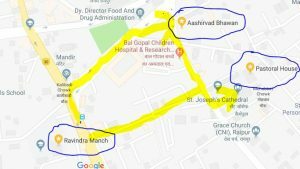 Distance from Raipur railway station- 3 km aprx. The accommodation for JSA participants is spread across 5 different places. Please find here, the state-wise allocation of accommodation. In addition, the organisers would arrange pickup and drop on the 22nd and 23rd for participants staying in Patidar Bhawan ( as the place is away from Venue of NHA). Please find the map for both the venue and accommodation : . Breakfast/ Morning Tea/ Lunch/ Evening Tea/Dinner will be provided at the NHA venue. Food would be provided to participants from the night of 21st September to 24th afternoon. As it might rain, please do carry your rain coat/umbrella etc. Kindly carry your Blanket, Bedsheet, Soap, toiletries, Odomos, own basic hygiene kit and medical kit with yourself. Avoid bringing any valuables/expensive if possible. During travel do not let your state/team go anywhere without your knowledge. Keep own photo ID (preferred) or piece of paper with basic information like name address and emergency contacts on it, in your pocket. Looking forward to meeting you at Raipur.